Fluid resistance is an area of interest to designers of rotating systems in fluid. FLOW-3D has a fully coupled, 6-degree of freedom model that can simulate numerous objects all moving in conjunction. The model calculates and outputs resistive data in terms of total resistance, pressure resistance and viscous resistance. The Moving Objects model that enables this capability is fully parallelized for efficient simulation times. Also, the way FLOW-3D‘s numerics are applied means that object collisions and efficiency of motion are optimized. Finally, many types of constraints can be assigned including, axial and rotational constraints, applied forces and torques, collisions based on friction and a coefficient of restitution, and tethering with springs or ropes. 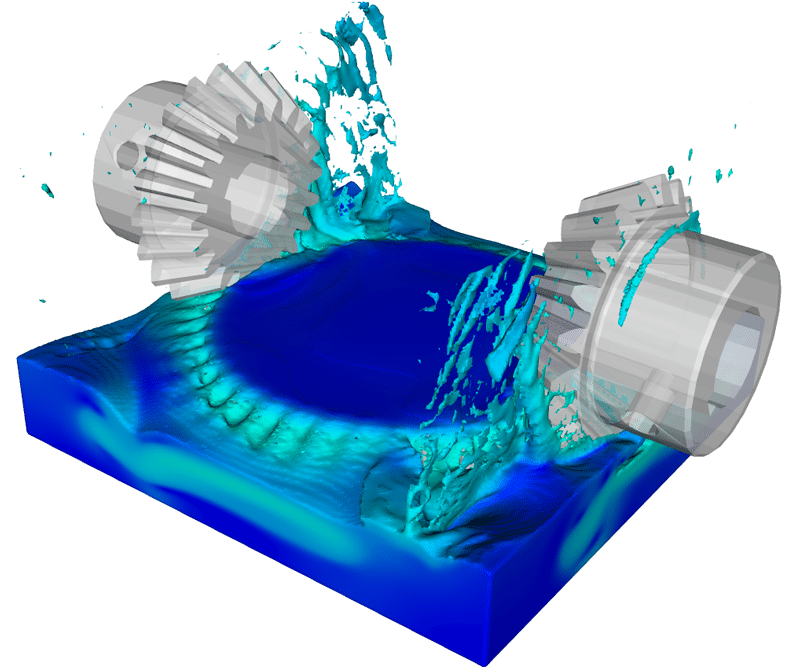 FLOW-3D simulation of a portion of an automotive differential.